** 2018 update. A couple of more recent meals have been a lower standard of food than my original review, the menu del dia is certainly good value but the food and overall score moved from 8 to 7.5. Baresca is the newest venture of the Perkin’s family, I previously enjoyed the food at their flagship restaurant at the carriage hall. The new restaurant is where the popular bar Dogma used to be and follows the theme of the group’s West Bridgford tapas spot, Escabeche. It’s pretty smart following a full refurbishment, the décor doesn’t scream rustic tapas bar at you, everything is a little too neat and offset with brushed steel. The atmosphere is good, laid back certainly and the staff were attentive throughout our meal even though we sat outside. They had a couple of small issues that will be addressed in time I’m sure. I do also like the significant counter dining that they have, there is also an area downstairs just for drinks. The menu is pretty substantial with many options for carnivores, pescatarians and vegetarian amply catered for. A good value set menu exists at £9.95, but we opted to try and much from the main list as we could manage. A flatbread with onion, pepper and thyme was thin and crispy with enough about it to keep you interested until the other dishes turned up. My tapas staple of choice is patatas bravas, so it had to be tried here. The tomato sauce was pleasant enough but the potatoes themselves were just under seasoned and lacking a crispness, I have been spoilt by the excellent version of this dish at nearby Iberico. My favourite dish of the evening was a pretty, chargrilled octopus number. Chorizo, potato, pepper and mint were well balanced additions and all worked in harmony with the smokey flavour from the char on the seafood. Almost taking the crown of top dish was Iberian pork cheek. 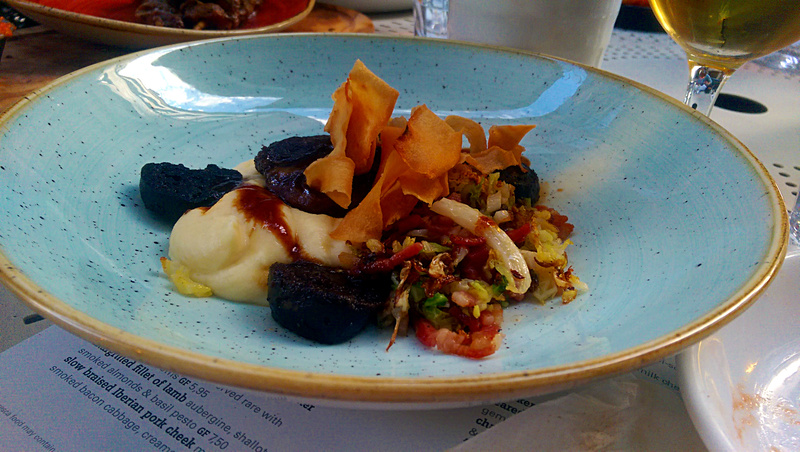 The meat itself fell apart and was paired with strong morcilla sausage (Spanish black pudding) atop some silky mash. A hint of freshness came from well cooked cabbage to the side. A number of other dishes were pretty good, we enjoyed carrot and courgette fritters that had an Indian influence. Moorish kebabs had a heavily herbed marinade/rub and were paired with a spicy pepper sauce that lifted them nicely. I didn’t agree with feta in my pazanella but it was otherwise sound, decent quality dressing showed a good touch. We sampled a couple of desserts and I really liked a Santiago tart. The tart itself is basically an almond cake which was lighter than you might think, the apple and ice cream working well with the nutty flavours from the tart. 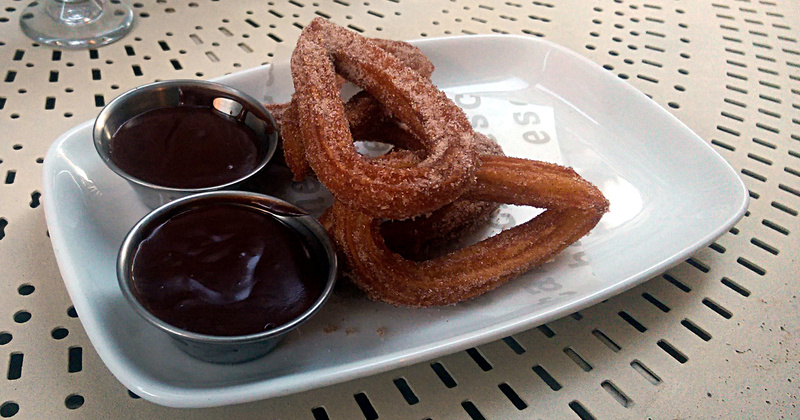 Churros were sadly not as good. They were either too thin or overcooked, or both. There was no doughnutty soft interior just the over crisp outer shell, the chocolate sauce was ok.
You’ll note from the dishes we had that there is a diversity of flavours and influences. We had food inspired by Italy, India, Morocco and this reflects in the wider menu too. I don’t have a problem with the style but given how Baresca sells itself it was a shame the two must disappointing dishes were Spanish classics. Prices were reasonable and ranged from £4 for a small dish to £8/10 for something more substantial like the pork cheek. I had a good meal at Baresca, better than a good meal in fact. I feel confident in saying it’s already one of the better restaurants in the city. I was hoping for bags of Spanish flavour and style, just I didn’t quite get that but what I got made up for it. I love Escabeche and have tried Baresca once. I think the menu del dia for £9.95 is fantastic value. I must actually eat from the full menu soon! I agree the carrot and coriander fritters were good; my favourite dishes are the chicken wings, the lentils with chili and feta and the chorizo with egg and potatoes.Thanks for the post! I ate here today and had an absolute shocker. 7/10 for service but a definite 1/10 for the food. Probably the worst restaurant meal I have eaten in my life. Maybe I was unlucky or things have changed a lot since 2015. Maybe worth a revisit on your part?